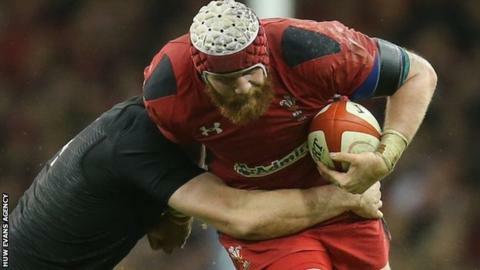 Second row Jake Ball sat out Wales' final training session on Friday "as a precaution" before of Saturday's match against Ireland in Cardiff. Ospreys' 20-year-old lock Rory Thornton took the place of Ball during the session at the Millennium Stadium. Australia-raised Ball has made 12 appearances for Wales. But defence coach Shaun Edwards said resting Ball was "very much a precaution, he should be fine by tomorrow". Edwards added that the opening warm-up game with Ireland under the closed roof at the Millennium Stadium will be a journey into the unknown. With two months training under their belts - including punishing camps in Switzerland and Qatar - Wales head into the first of three games with four Test debutants and a new captain. Centre Scott Williams takes over the armband as Eli Walker, Tyler Morgan, Dominic Day and Ross Moriarty are given an opportunity to impress before the final World Cup squad is cut down to 31 at the end of the month. "It is very unusual, particularly for some players playing for those World Cup spots, for your first game of the season to be the biggest game of your season," added Edwards. "We are all competitive people, and any game of rugby that you go into you desperately want to win, particularly in front of your own fans. "No-one kind of remembers who wins friendlies in six to eight months' time, but in the here and now it is very important for us because people are playing for spots and you want to get the momentum going into a Rugby World Cup. "It is almost like we are going into the unknown a little bit because we have got a lot of players who haven't played together before, and a lot of players we've seen play before but who are playing with players they haven't played with before." Wales have put significant emphasis on their fitness work in preparation for a World Cup group containing Australia, England, Fiji and Uruguay. Edwards, though, said there has been a gradual shift towards tactics and ball work. "We are pretty happy with where we are conditioning-wise," he added. "We have put a lot of hard work in during those two camps. "Let's be honest, the best rugby team is going to win the World Cup, not the best athletics team. "Obviously, being fit and well conditioned enables you to carry out the game-plan that you want to play, but in the end we are a rugby team, and the best rugby team is going to win the World Cup."